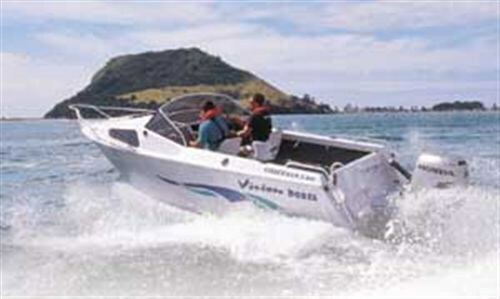 Tauranga's Vision Boats has carved out a niche in the highly competitive aluminium trailer boat market, producing high quality, affordable boats with a reputation for handling the rough stuff. Steve Raea joins builder Geoff Bishop for a day out on the popular 5.6m Wide-Body Fisherman. Deep in the Bay of Plenty heartland, Tauranga designer and builder Geoff Bishop and his team are working on a vision. The project is a Vision Boats 5.6 metre aluminium Wide-Body Fisherman - a refined model of the original design that launched Vision Boats onto the New Zealand boating scene almost seven years ago. With hull number 97 nearing completion and orders in his book, Geoff is quietly confident that his own vision is fast becoming a reality. And that, he says, is to be recognised as a manufacturer of quality hand-made aluminium boats that rival the competition in terms of quality, price and performance. It's an ambitious task in a competitive industry, but Bishop has already been described as a silent assassin on the powerboat market, selling his boats as fast as he can produce them. And for an owner-operator, that is no small feat given that Vision's marketing is largely by word of mouth. In the three and a half years since Bishop took over the Vision Boats business he has developed and redefined his power boats which range from 5.3 metres to 8.0 metres and include cuddy cabin and hard top models. Vision's biggest seller is the 5.6 metre Wide Body Fisherman which, in many ways, epitomises the qualities of aluminium in small boat construction proving again that not only is aluminium strong, it can be moulded, bent and pressed to create hull shapes that are also pleasing to the eye. And at $17,155, the 5.6 metre Fisherman must surely rate as one of the best-value hulls on the market given the quality of build, standard of features and a sea-keeping ability that has been proven time and again on the testing grounds of the Manukau and Kaipara Harbours. Bishop's design philosophy revolves around the adage that there is no point in making change for change's sake. Refine by all means, but when the formula is right leave good alone. And that, he says, is largely what he has done with Vision's series II boats. 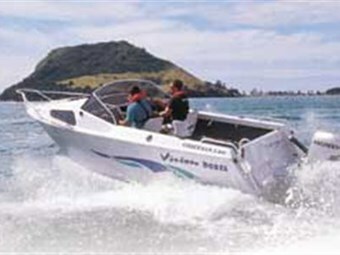 Vision's early models quickly established a reputation as being seriously good sea boats but were considered by some to be a bit tender, putting a question mark over their suitability as an all round family boat. There was no question, however, that the boats were well suited for offshore work given their handling and performance in the rough. It was something Bishop gave a lot of thought to. On the one hand he did not want to compromise the hull's sea-keeping qualities yet, he wanted to build in more stability to satisfy the particular demands of family boating. 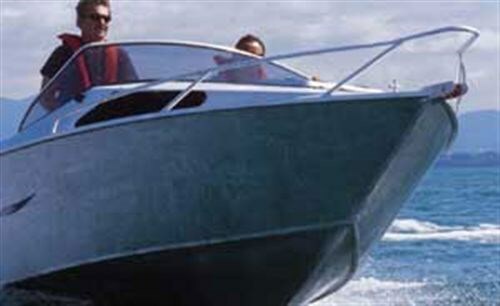 The resulting changes are subtle; an increase in chine width from 50mm to 150mm and a slight increase in the boat's variable deadrise from 15 to 16 degrees. The look of the boat has not changed with the same pronounced deck and cabin curvature that gives the boat its appeal. As Bishop says, the rounded built was a deliberate move to get away from the box-like structures so often associated with aluminium boats. "A boat must be practical and perform well at sea but that doesn't mean it has to look ugly." The Fisherman is, in fact, a sweet looking boat with a soft, almost rounded, appearance more often associated with fibreglass designs. The look was partially achieved by shaping the gunwhales and decks in a brake press, creating large radius folds in the aluminium. This was further necessitated because of Bishop's choice of marine grade plate for the cabin and decks. Up close, however, there's no mistaking the construction. Its aluminium through and through, right down to the boarding ladder on the portofino stern. Bishop is the first to concede that his boats are short on frills and makes no apology for it. "Frills, he says, fall off over time and that leaves a bad taste in buyers mouths. I want my boats to look the same after five years' use as they did when they first rolled out of the shed. Fancy bits have a place, but not on my boats." The Fisherman is undoubtedly a strong boat with 6mm high-tensile marine-grade plate on the bottom and 3mm marine-grade plate on the topsides and cabintop. The under floor construction consists of four 5mm bearers running the full length of the hull with 5mm straps welded in to hold it all together. The bulkheads are all 5mm and welded in place. Its high topsides and gunwhale which provides a deep cockpit further influence the look of the boat. The layout is simple and practical, reflecting its primary purpose as a fishing platform. The only fit-out to speak of is a pedestal seat on the driver's side and a king/queen seat on the passenger seat with storage underneath. Further storage is provided in twin side pockets that run the full length of the cockpit. A parcel shelf in the stern houses the battery box. The bilge pump sump is located aft under the tread-plate floor. A removable 100-litre aluminium fuel tank is fitted into the cockpit sole with the filler built into the transom. Buoyancy chambers, one each side of the fuel tank, run the full length of the cockpit.íhe portofino stern runs full width with a decent cut-out on the port side allowing easy access to and from the transom platform and swim ladder. The cabin is surprisingly roomy for the boat's overall size, and deep enough to give good sitting headroom. The squabs down each side are adequate for overnighters. Bishop says an in-fill squab can be arranged, providing a double for the more adventurous. The cabin sole is again aluminium tread plate, the idea being to provide sure-footed access to the anchor locker through the Weaver deck hatch. The cabin sides and bulkheads are carpeted for comfort and noise suppression. The test boat was fitted with a new Honda 90 four-stroke outboard that, in Bishop's opinion, was perfectly matched to the boat. The Fisherman will take up to 150hp but handling, fuel economy and range will be compromised accordingly. Conditions in Tauranga were almost perfect for a boat test with a good two metre swell running in through the heads with a bit of chop on top to perk things up. In sheltered waters, the Fisherman climbed on to the plane effortlessly and cruised comfortably at about 30mp/h at 4500rpm. The noise from the Honda was barely discernable and the ride was comfortable and dry. The Fisherman, however, comes into its own when thrown hard over into the turn, the boat hardly rolling, instead digging her big chine in, barely slipping at all. The forces were quite dramatic, but the smile on Bishops' face said it all: "You'd have a bloody hard time getting into trouble in this boat." And he's right. The stability under way was indeed impressive, even when throwing looping turns on the tops and backs of swells rolling into the harbour. Beyond the harbour entrance, the boat rode flat and dry when properly trimmed and tackled the swell with ease at about 20 mp/h. With power on (4,500rpm) the Fisherman fair leapt through the seas but did not land with the bone-shattering crunch you might expect. The hull was giving a softer ride than you might reasonably expect from a boat of just 5.6 metres. The boat tracked well and stayed dry, even when pushed hard into the back of the swells ahead. Following seas can often create difficulties with some boats prone to surf off and bow-ride. The Fisherman showed no tendency to do so, even when launched at speed off the top of the biggest swells. Despite considerable air, the boat felt safe and manageable, landing with a stern first attitude and a willingness to pick herself up and charge on undisturbed. Bishop says the Fisherman's quality of ride and mild manners in a seaway are the two points that owners comment on. "It's interesting. We find our boats are being sold in little pockets around the country. Someone buys one and takes his mate fishing. His mate decides he needs one too, and before we know it we've got one or two orders from the same place. We sold three to the Kaipara in close succession and two to Waiuku, again, all as a result of word of mouth." To my mind, the Fisherman represents good value and is particularly suited to users who want a no frills but well engineered boat that will stand up to most conditions and requires minimal maintenance. While it may lack some of the creature comforts of more expensive boats, there is enough room in the cockpit and cuddy to set the boat up for users' particular requirements, whether it be deep sea sports fishing or twilight barbies in the harbour. Bishop says he plans to display the Fisherman, and possibly the 6.5m Hard Top at the New Zealand Boat Show in Auckland at Queens Birthday Weekend.